What's in a name? Or, more importantly, what's in a digit? Would that which we call an iPad by any number less than 2 be less sweet? That's the question Apple posed for us indirectly when it unveiled the new iPad and relegated its future slates (and, presumably, phones) to a numeral-free future. And that new slate? It's much the same as the old one, with a slightly more chipper processor at its (quad) core and support for both Verizon and AT&T's fancy new LTE networks. But there's one bigger change here, one that will ripple across the industry as each manufacturer struggles to keep up in this ever-accelerating market. That feature is the iPad's new 2048 x 1536 Retina display. It's the best display ever featured on a tablet, probably the best display ever on a mobile device, but is that enough to keep this tablet ahead of the pack? Believe it or not, the answer is yes. Apple's new iPad offers neither a massive improvement in performance nor functionality, but the new display alone makes it a great update. How would you rate the iPad 3rd-gen 3rd-gen? Ever held an iPad 2? If so, suffice to say this new iPad is a wee bit thicker and a teensy bit heavier. You now have our full blessing to skip down to the display section below, which is what you're probably truly interested in reading about. If you didn't know any better you'd think it were completely solid. For those looking for the full-on review effect, the new iPad is still a slinky thing. Sure, its 9.4mm thickness won't win it any awards (especially since that's .6mm thicker than the iPad 2), nor will its 652g (1.4-pound) heft (51g / .11 pounds more than before), but it feels neither big nor heavy. It instead feels substantial. Dense. It's carved from a hunk of aluminum and there's a cavity in there where the (now bigger) battery and other internals reside, but if you didn't know any better you'd think it were completely solid. There's none of the flex or the give found in cheaper slates. That solidity certainly helps explain the premium feel, but buyers will have to decide whether that feel is worth the extra space in their messenger bags, or the extra strain placed on shoulder straps. The chassis is hewn from the same matte aluminum as most of Apple's other devices, with a gentle curve on the edges tapering down to a flat back punctuated by a glossy black Apple logo. The shape of that taper is slightly different than before, a bit more rounded on account of that extra girth, but you'll be hard-pressed to notice without a side-by-side comparison. Looking at the back you'll still find the speaker in its same lower-left position, still a rather unfortunate placement. Most of the sound is therefore directed away from where you want it, namely in your ears, and we can't say as we noticed any improvement in the overall aural quality compared to this tablet's predecessor. Next to that is the dock port, still the full-sized 40-pin variety and not the slinky, next-gen connector that we've been hearing is in the works, so your accessories live on for at least one more generation of tablets. Move up to the side and you'll find the same volume rocker and mute / rotation lock as before, situated in the same place, too. Kitty-corner to that is the wide and flat power button, separated from the 3.5mm headphone jack over on the other side by the same expanse of black plastic seen on the iPad 2, making room in the metal chassis for the antennas to do their thing. WiFi-only models get by without this polycarbonate indiscretion. Swing around to the other top corner and you'll find the door behind which rests the SIM. LTE does need a SIM, even on Verizon, and there are new iPad versions supporting LTE on both AT&T and Verizon. (Rogers, Bell and Telus in Canada, too, though Telstra LTE in Australia is sadly not compatible.) There are different devices here, one for AT&T and another for Verizon, but either offer comprehensive non-LTE wireless connectivity options, including MTS / HSPA / HSPA+ / DC-HSDPA (850, 900, 1900, 2100 MHz) and GSM / EDGE (850, 900, 1800, 1900 MHz). That means even if you aren't in LTE-land you can expect up to 42Mbps download speeds, which is much faster than the iPad 2. The WiFi-only models naturally lose all that, but all varieties offer 802.11a/b/g/n connectivity along with Bluetooth 4.0. Even the WiFi-only model can make use of the new voice dictation feature here, which adds a microphone button down next to the keyboard. In our testing it's impressively accurate, capturing even odd words like "Schenectady" without pause. It only works when you have an active network connection and, sadly, its no Siri, which is still not available. The new iPad will not find you directions to body hiding spots nor tell you the weather. The one final detail on the back is the slightly enlarged portal behind which the new five megapixel camera assembly peers through. It's rimmed by a bit of polished metal as on the iPad 2, so things don't look noticeably different from the outside, but as ever it's what's on the inside that counts -- and indeed you'll have to look a little deeper in this review to see how that new sensor. The biggest change of all, however, is right there on the front, though tragically for those who like to make appearances the black (or white) glass facade looks exactly the same as it did before. Turn it on, though, and everything changes. If you're disappointed Apple didn't do more with the new iPad, that's probably because you haven't seen the new Retina display yet. If you're disappointed Apple didn't do more with the new iPad, that's probably because you haven't seen the new Retina display for yourself yet. Take more than a passing glance and you'll be a believer. Of course, a cynic would say that it's really Samsung who's been doing all the hard work here, as this is (for now, at least) a panel sourced from that company, which should be a strong indicator that Apple's strongest competition on the Android side won't be far behind in launching its own high-res wunderslate. The biggest talking point is, of course, the truly bonkers resolution. 2048 x 1536 means four times the pixels of the previous iPads and, indeed, a full million more than your average 1080p TV. On the 9.7-inch display this works out to a pixel density of 264ppi. That's considerably lower than the 326ppi the iPhone 4S manages and, indeed, below the magic 300ppi barrier Apple had earlier specified for the "Retina" moniker. But, as you're expected to hold the new iPad further from your face than your phone, the perceived pixel density is said to be comparable. Really, though, the numbers will be quickly forgotten once you get a look at this thing. If you've previously made the leap from a lower-resolution iPhone to one packing a Retina display you have some idea of what to expect here, but the increased scale really makes the difference shine. For example, viewing photos on an iPhone was never particularly pleasant to begin with. It always felt too cramped -- okay for a quick "hey, check this out" kind of experience, but not something you'd want to do for long stretches. Looking at photos on the iPad, however, has always been a very satisfying thing, and with the new iPad it's even more so. Not only are things rendered to a higher definition, they're also presented with greater accuracy. 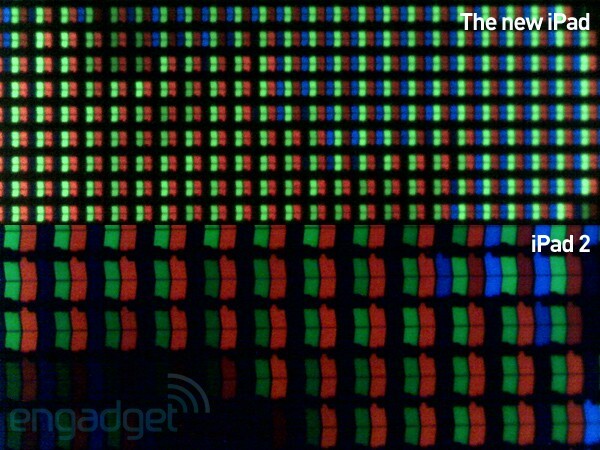 No, the reds and greens won't beat you over the head like they do on one of Samsung's Super AMOLED Plus displays, but everything here just looks right. The new iPad screen offers a considerably increased contrast and gamut, meaning colors are not only brighter and more striking but more accurate. No, the reds and greens won't beat you over the head like they do on one of Samsung's Super AMOLED Plus displays, but everything here just looks right. That said, stack it next to an iPad 2 and you'll notice the new display is far more cool, and you're unfortunately given no control over that. A few pictures, like of a bright red Ferrari, actually look slightly more accurate on the old display, but by and large the new panel blows the old one away. This is truly a spectacular display, and in typical IPS fashion it doesn't disappoint at odd angles. It maintains its splendor at broad enough perspectives to ensure your friend on the other side of the couch can also enjoy your latest YouTube fave. Yes, there are a lot of hyperbolic adjectives up there in the preceding paragraphs, but that's simply because this is a genuinely nice display. It raises the bar, and that's a good thing. We can't wait to see how the competition responds. Of course, to make the best use of this new display you'll need new apps that have been up-sampled to take full advantage, and thankfully there are plenty. All of the stock iOS apps have been retooled already, while many big third-party players like Amazon's Kindle app and Evernote have already been upped as well, and the difference is noticeable. 1080p content looks considerably better than on the iPad 2, as you would expect, but even 720p content shows a noticeable improvement. That shouldn't necessarily be a surprise, though, since the old tablet couldn't even manage that resolution. Adding four times the pixels means a lot more work for the CPU and GPU, and the trusty 'ol A5 processor just wasn't up to the task. So, Apple did a little... augmentation, creating the A5X. This processor keeps the same dual-core CPU as the iPad 2 but pairs it with a new quad-core graphics component. The result? Predictably the same when it comes to the CPU-taxing Geekbench, which gave us exactly (nearly) the same score. The web-based SunSpider benchmark was the same. We averaged a low 2,100ms score on the iPad 2 and the new iPad averaged at 2,111ms. So, don't be expecting a revolutionary change when it comes to day-to-day usage, but really we still find the iPad 2 to be far more snappy and responsive than just about anything else on the market. So too, then, is the new iPad. This is the first iPad to offer 4G LTE wireless, and so we were naturally quite eager to load up Speed Test and see what it could do. We received a Verizon model to test and it did not fail to impress, delivering download speeds consistently in the 22 - 25Mbps down range. Uploads, meanwhile, hovered between 16 and 19Mbps with 50 - 70ms pings. That is, needless to say, quite healthy. We also had the opportunity to test an Orange model in the UK and saw speeds averaging 3.5Mbps down and just north of .5Mbps up. That too is respectable but will likely leave you pining for the day the cooling rays of LTE to show up in your hood, especially since the iPad can be used as a wireless hotspot for no extra cost. We had high expectations for battery life, despite those substantial improvements to both the built-in radios and display. The new pack inside the iPad is rated at a massive 42.5 watt-hours. That's nearly double the size of the 25 watt-hour pack found in the iPad 2. The reason for the boost is to make sure there are plenty of electrons to shovel into the LTE antenna and the new A5X processor, both of which are presumably quite hungry. Apple rates the new iPad at 10 hours of casual surfing on WiFi or nine hours if you're doing it using cellular data and our own video rundown test gave a similar rundown time. At 50 percent brightness, our European model on HSPA pushed out just under 10 hours of constant playback, with 3G and WiFi on. That's barely half an hour behind its predecessor, despite this year's hardware improvements. Our Verizon LTE model, meanwhile, came in just 15 minutes shorter, again with LTE and WiFi firing. It's worth noting, though, that all that juice not only takes a long time to drain but it takes time to charge, too. We've found the new iPad takes much longer to refill on the charging stand than the iPad 2. No surprise, given the nearly 100 percent increase in battery capacity. 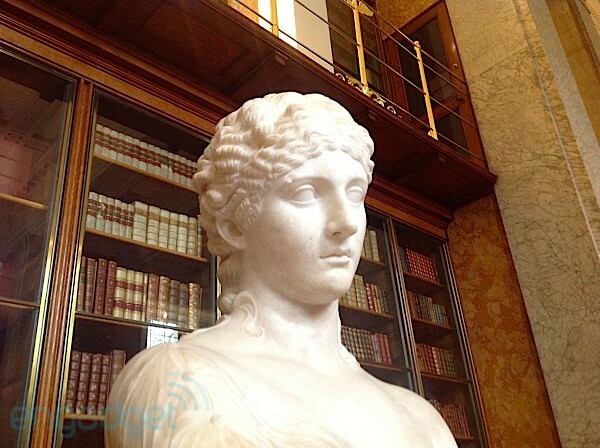 We called the cameras on the iPad 2 "pretty bad" and, well, they are. Thankfully Apple has finally raised the game on the rear shooter for the new iPad, but it's unfortunately left the front-facing VGA FaceTime camera alone. If you're sick of looking murky when FaceTiming with loved ones from a dimly lit room, we're sorry to say it might be time to finally invest in that extra lamp. Obviously, the company's time and effort was spent focusing on the lens poking out the back, but in some ways that, too, is a bit of a let-down. 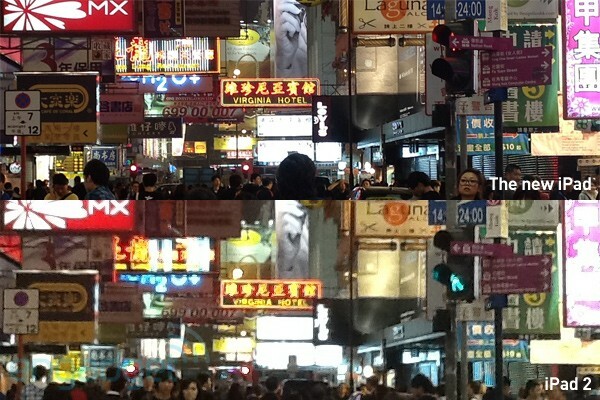 It's a 5-megapixel unit consisting of the same five-element, f/2.4 lens and stabilization processing wizardry found in the iPhone 4S. 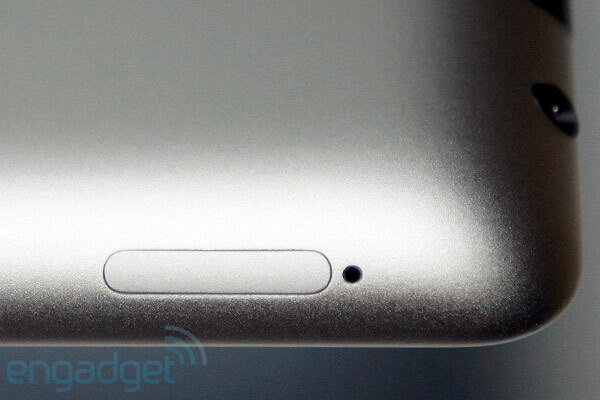 But, curiously, the bigger iPad takes a step down to a more lowly 5-megapixel sensor. But, move past megapixels (as we encourage most digital shooters to do) and you'll find the image quality to be very high here. We found it very easy to take pleasing photos with the new iPad but we didn't see the drastic increase in shot-to-shot speed that we did on the 4S. 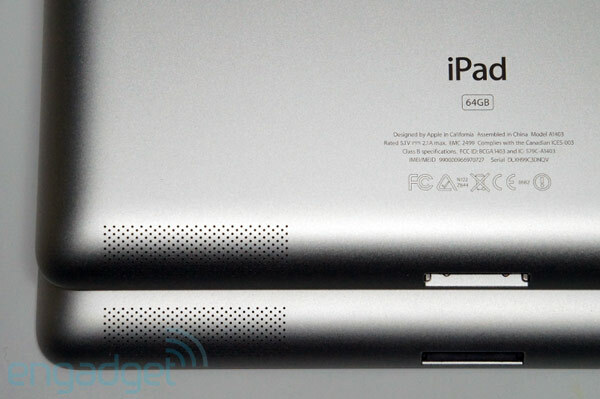 That phone wowed us with its rapid-fire prowess, and indeed the iPad 2 is quite snappy moving from picture to picture. The new iPad is much slower. 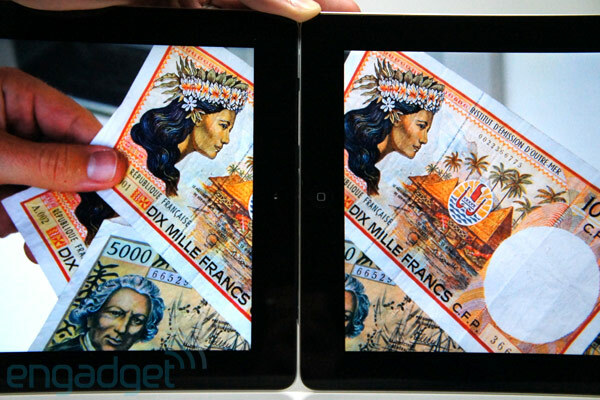 It's still plenty quick, on the order of two shots per second, but we'd estimate the iPad 2 is roughly twice that fast. Still, we'll take quality over quantity, and the new iPad shots are far more pleasing to the eye. Video has stepped up a good bit too, to 1080p from the previous 720, and again we saw a nice increase in quality over the former iPad. While we still hate the idea of taking pictures or videos with something packing a 9.7-inch display, if you must you will at least have great results now. Thankfully, most cases aren't made to exacting specifications, so there's a very good chance your old sleeve will do just fine. 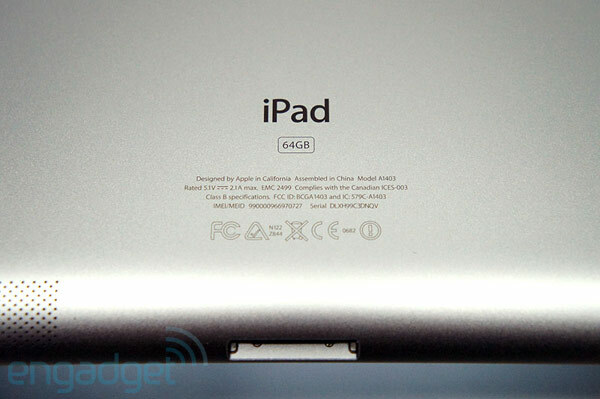 So width and height are the same as the iPad 2, but as we mentioned above thickness is now .6mm greater than before. That's but a sliver of a difference and difficult to notice unless you stack the two next to each other, but if you're dealing with a finely-crafted case made to exacting specifications that increase is more than enough to cause issues. Thankfully, most cases aren't made to such high standards, so there's a very good chance your old sleeve will do just fine. We tried a few different sleeves and loose cases and there was no issue with the majority of them. Some plastic-backed cases that clip on refused to hold on very securely, but for the most part this new iPad is backwards compatible. 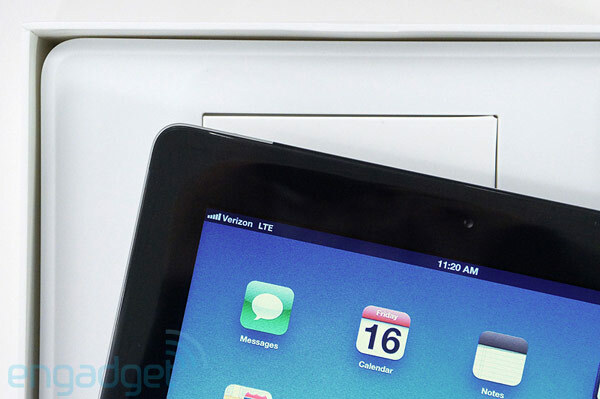 Indeed, Apple's own Smart Cover clips on to the side magnetically just like on the iPad 2. In fact all the other first-party iPad accessories should be perfectly compatible, thanks in large part to the continuation of the 40-pin dock connector. And, thanks to the hugely useful iOS version of iPhoto, the SD Card Reader and Camera Connector are of particular value now. 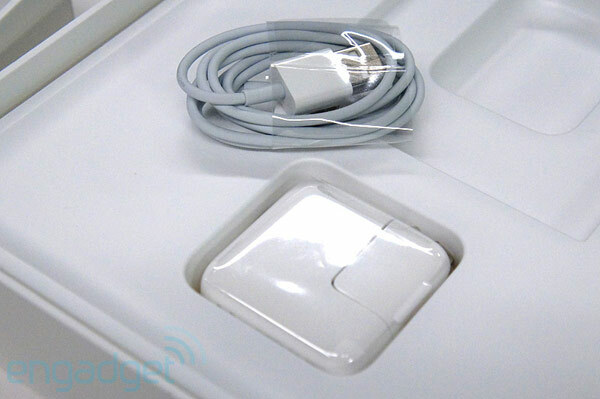 But, the best accessory for the iPad will likely prove to be the new Apple TV. This guy features a friendlier UI and, finally, 1080p support. It isn't the iOS-having, app-running update that we've been hoping for, but beaming 1080p content straight to your TV over AirPlay is about as easy as it gets and, for many, worth the $99 price of admission. The new iPad is priced exactly the same as the old iPad used to be. That is to say, a 16GB model starts at $499. 32GB costs $100 more and 64GB is another $100 on top of that, for a range-topping price of $699. Rather unfortunately there's still no 128GB option, a particular shame given the size of the textbooks Apple is now hawking. More storage is a must for whatever the next new iPad turns out to be. The 3G / LTE models, whether you choose AT&T or Verizon, will cost you $130 more. So that's $629, $729 or $829. Cheap? No, but those are at least off-contract prices. As before, data plans are all month-to-month, so no worries about signing away the next two years of your wireless freedom. You'll simply buy your data at the beginning of the month and next month, if you want more, you'll have to pay again. On AT&T you're looking at 250MB for $14.99 monthly, but on LTE we could see blowing through that in a day. A more realistic 3GB will cost you $30 while 5GB is $50. AT&T does not offer tethering yet (though it intends to in the future), so if you want your slate to also be a portable hotspot today you'll need to go to Verizon. There you'll be paying $20 for 1GB, $30 for 2GB, $50 for 5GB and $80 for 10GB on the top end. If you opt to buy your iPad pre-activated through Verizon they'll also give you the option of paying $10 for every GB over your allowance. Update: We've updated the review to include full battery run-down figures. Also, we've clarified that there are effectively three worldwide models of the new iPad. To lay things out: there are two LTE-flavors, including the Verizon version which is available only in the US. Then there is the US AT&T LTE version, which is also sold in Canada and abroad. Finally, there is the WiFi-only variety. Mat Smith, Richard Lai and Zach Honig contributed to this review.